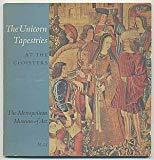 The Unicorn Tapestries - Allegory of Christ, or a Happy Husband? 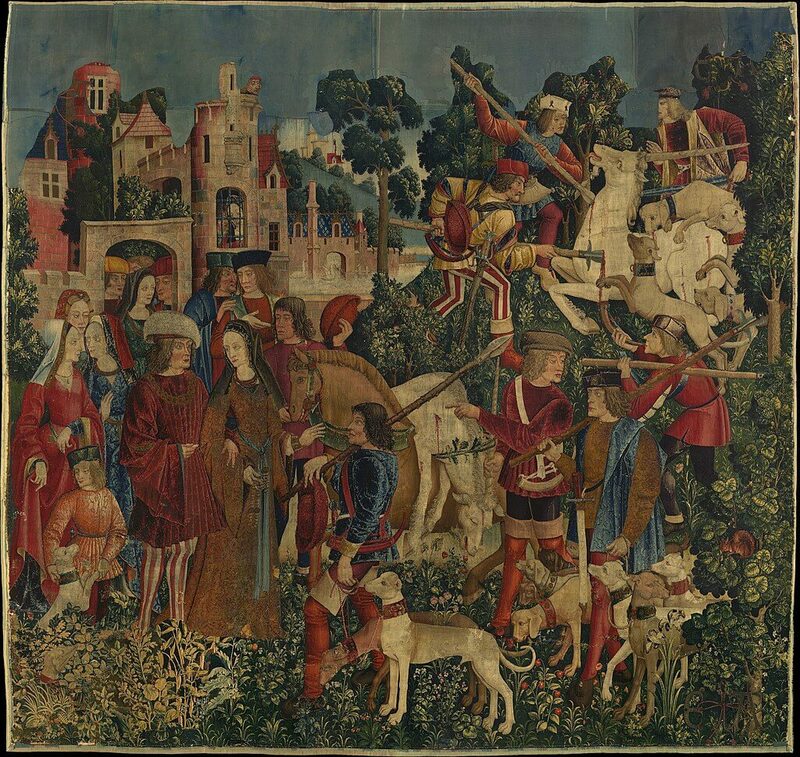 The Unicorn Tapestries – Allegory Of Christ, Or A Happy Husband? 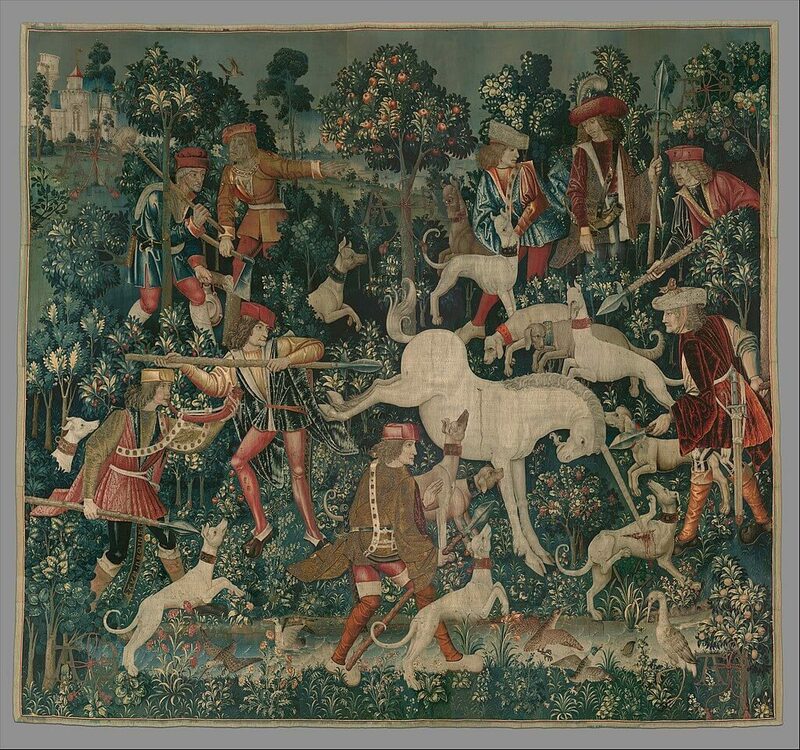 The Unicorn Tapestries are a set of medieval tapestries depicting the hunt for a unicorn. 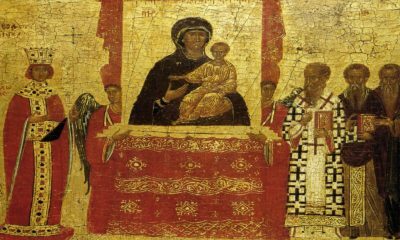 They’re probably the most famous tapestries ever, and they’re definitely among the most famous medieval artworks. 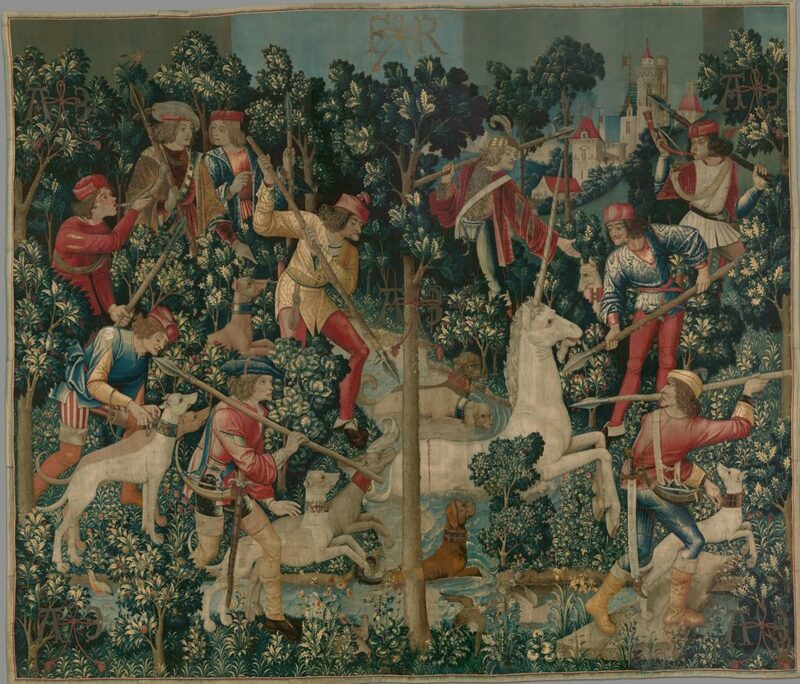 The Unicorn Tapestries include seven large panels. 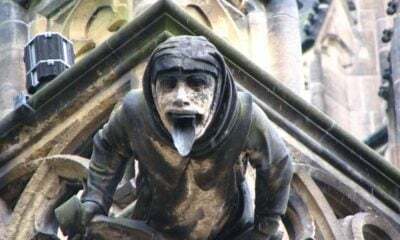 They are all from the South Netherlands, probably Flanders, 1495-1505. They have two possible interpretations, and both are based on medieval unicorn symbolism. The first five tell a story based on medieval stag hunts, only with a unicorn substituted for the stag. 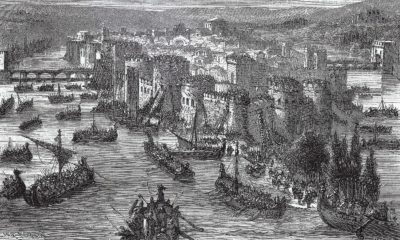 These panels show everyone who would have been involved with a stag hunt, including a nobleman, hounds, horses, and all the people who actually conduct the hunt. While these are attractive scenes with bright colors and lush foliage, they can also be very violent. After all, they end with the unicorn’s death. The remaining two panels more clearly address the symbolism unicorns had in the Middle Ages. According to medieval mythology, only a maiden could subdue a unicorn. The panel called the Mystic Capture of the Unicorn is only two fragments, but it would have originally shown a young maiden taming the unicorn. she isn’t the woman in the red dress, though. 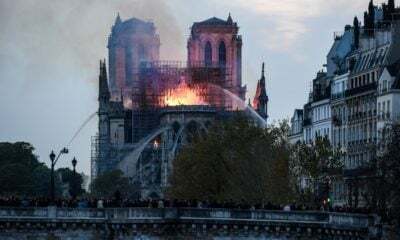 There was once a second woman in the image. 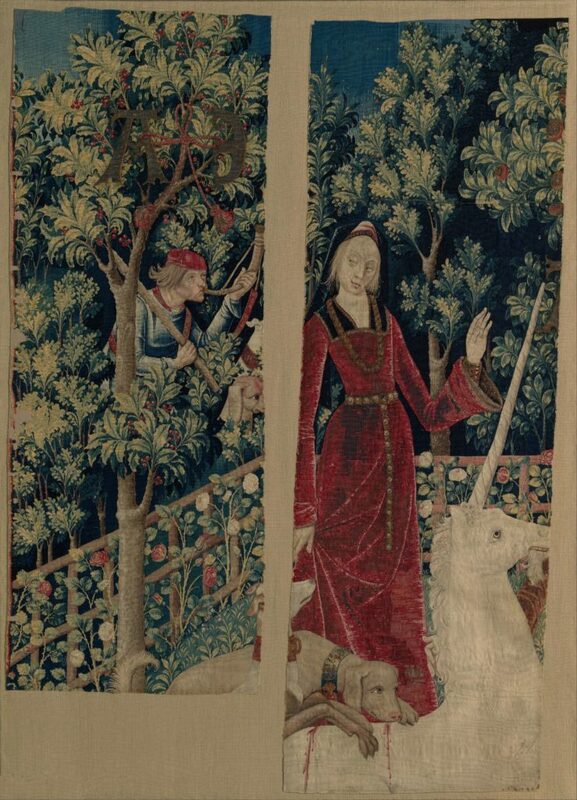 In the Unicorn in Captivity, which is probably the most famous of the panels, the unicorn is confined to a garden, probably because the maiden put him there. There are two possibilities as to what this means. One is that the unicorn is a symbol for Christ, and the maiden who tames him refers to the Virgin Mary. In this sense, the hunt for the unicorn refers to the crucifixion. People in the Middle Ages believed that the unicorn’s horn had healing powers, so it makes sense that they saw parallels with Chris. Under this interpretation, the Unicorn in Captivity panel might represent the risen Christ since it shows the unicorn alive after being killed in the hunt. The second possibility is that the unicorn represents a happy husband tamed by his love for the maiden.  This was a common feature of the courtly love poems popular at this time. 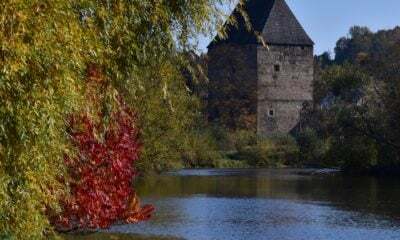 In this case, the garden may represent something called a “hortus conclusus”, which was a medieval symbol of fidelity. 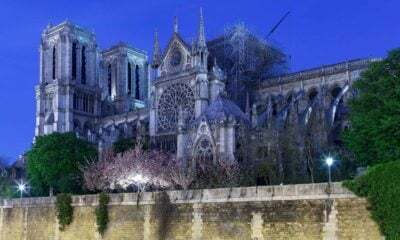 The chain holding the unicorn inside the garden is called a “chaîne d’amour”, and it also featured in courtly love poems. Five of the seven Unicorn Tapestries are full of naturalistic plant and animal details. In fact, there are over one hundred species of plants depicted in the Unicorn Tapestries, and most of them are identifiable. 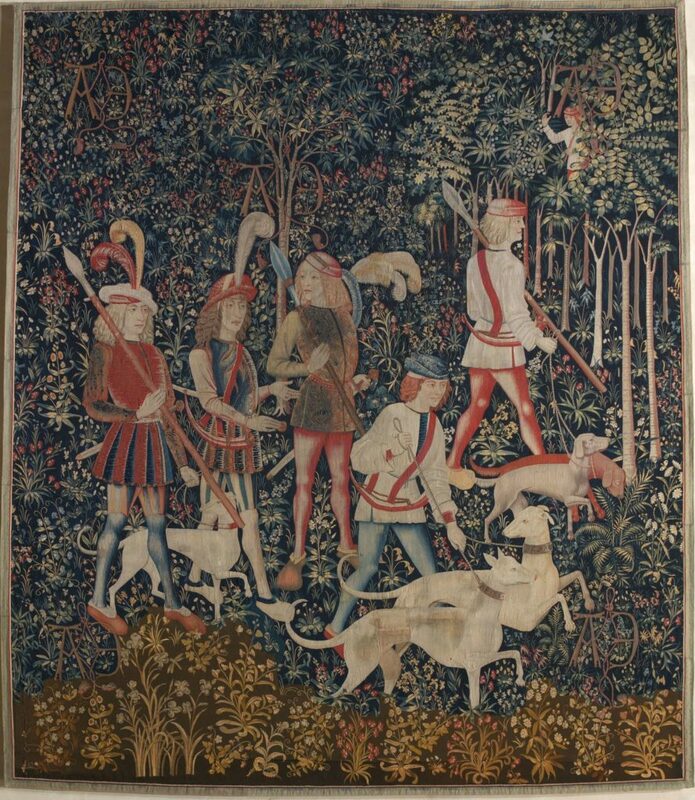 The other two tapestries (The Hunters Enter the Woods and The Unicorn in Captivity) have an all-over floral background called “millefleurs”, which is French for a thousand flowers. It’s this difference that makes people think that the tapestries were not meant to be one cohesive set. Some scholars think that the tapestries originally hung in a bedroom, with the first five panels on the walls and the other two over the bed. 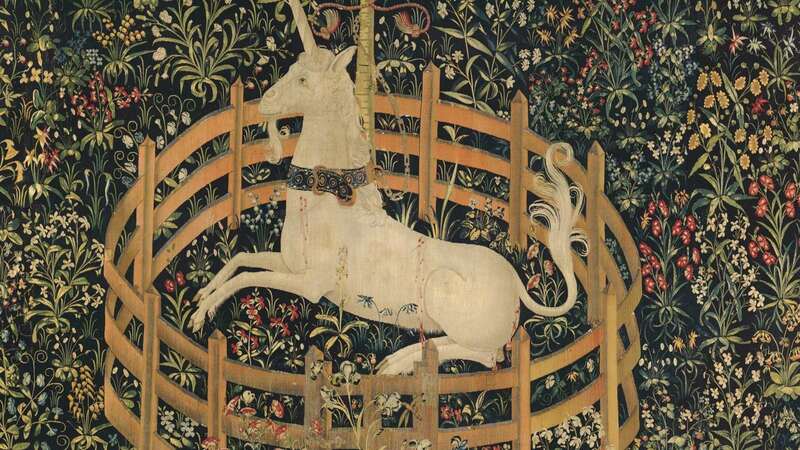 Unfortunately, nothing is known about the Unicorn Tapestries’ original owners. 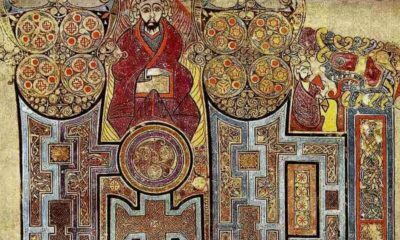 The “AE” monogram that appears on five of the panels and the “FR” monogram on another one provide clues to support a few different theories. American financier J.P. Morgan eventually purchased the panels and donated them to The Cloisters in New York. There, they appear in a gallery set up to mimic the sort of medieval room where they probably hung originally. 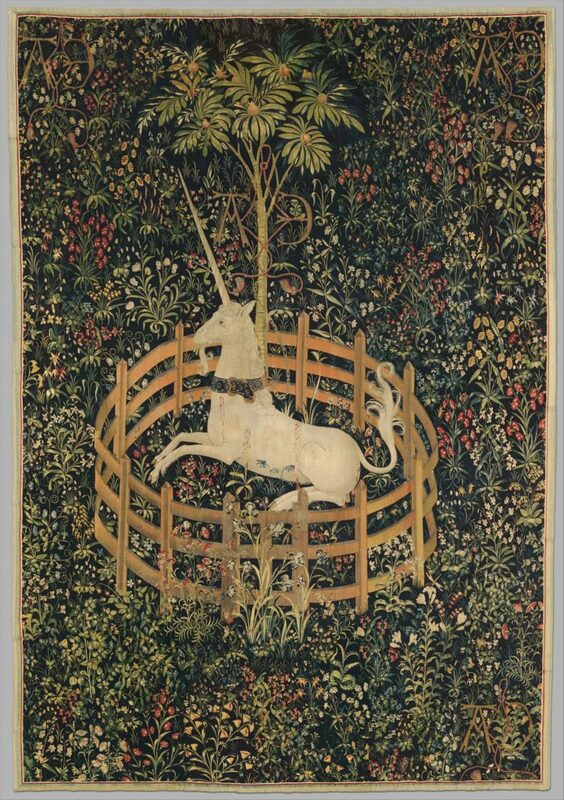 Freeman, Margaret B., The Unicorn Tapestries. New York: Metropolitan Museum of Art, 1976. 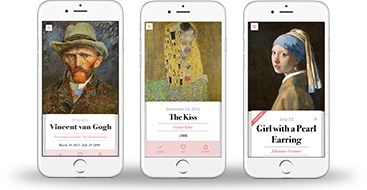 Accessible online. 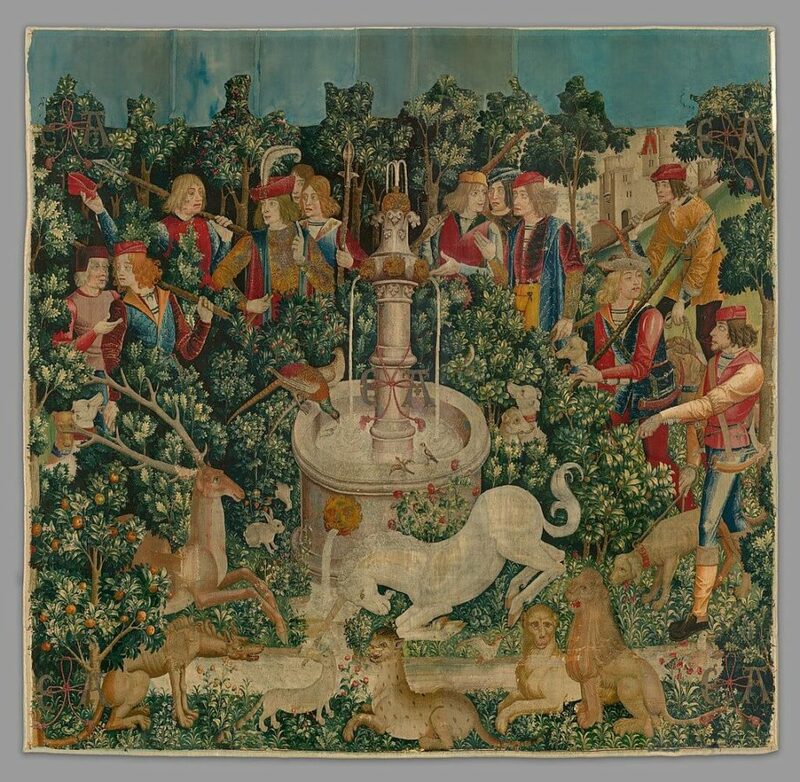 Metropolitan Museum of Art collection database entries on the Unicorn Tapestries: “The Hunters Enter the Woods“, “The Unicorn is Found“, “The Unicorn is Attacked“, “The Unicorn Defends Itself“, “The Unicorn is Killed and Brought to the Castle“, “The Mystic Capture of the Unicorn“, and “The Unicorn in Captivity“.